Buzz Aldrin (/ˈɔːldrɪn/; born Edwin Eugene Aldrin Jr.; January 20, 1930) is an American engineer, former astronaut, and fighter pilot. As lunar module pilot on the Apollo 11 mission, he and mission commander Neil Armstrong were the first two humans to land on the Moon. Born in Glen Ridge, New Jersey, Aldrin graduated from the United States Military Academy at West Point in 1951, with a degree in mechanical engineering. He was commissioned into the United States Air Force, and served as a jet fighter pilot during the Korean War. He flew 66 combat missions and shot down two MiG-15 aircraft. Buzz Aldrin (/ˈɔːldrɪn/; born Edwin Eugene Aldrin Jr.; January 20, 1930) is an American engineer, former astronaut, and fighter pilot. As lunar module pilot on the Apollo 11 mission, he and mission commander Neil Armstrong were the first two humans to land on the Moon. After earning a Sc.D. degree in astronautics from the Massachusetts Institute of Technology, Aldrin was selected as a member of NASA's Astronaut Group 3, making him the first astronaut with a doctoral degree. His doctoral thesis was Line-of-Sight Guidance Techniques for Manned Orbital Rendezvous, earning him the nickname "Dr. Rendezvous" from fellow astronauts. His first space flight was in 1966 on Gemini 12 during which he spent over five hours on extravehicular activity (EVA) outside the spacecraft. 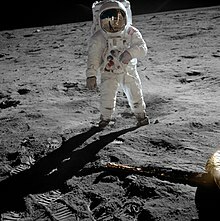 Three years later, Aldrin set foot on the Moon at 03:15:16 on July 21, 1969 (UTC), nine minutes after Armstrong first touched the surface, while Command Module Pilot Michael Collins remained in lunar orbit. A Presbyterian elder, Aldrin became the first person to hold a religious ceremony on the Moon when he privately took communion. 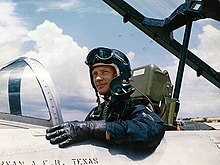 Upon leaving NASA in 1971, he became Commandant of the U.S. Air Force Test Pilot School. He retired from the Air Force in 1972, after 21 years of service. His autobiographies Return to Earth, (1973) and Magnificent Desolation (2009), recount his struggles with clinical depression and alcoholism in the years after leaving NASA. He continued to advocate for space exploration, particularly a human mission to Mars, and developed the Aldrin cycler, a special spacecraft trajectory that makes travel to Mars possible using less time and propellant. He has been accorded numerous honors, including the Presidential Medal of Freedom in 1969, and is listed in several Halls of Fame, and has plaques on the Hollywood Walk of Fame. Aldrin entered West Point in 1947. He did well academically, finishing first in his class his plebe year. He was a member of the academy track and field team. In 1950 he traveled with a group of West Point cadets to Japan and the Philippines to study the military government policies of Douglas MacArthur. During his trip, the Korean War broke out. On June 5, 1951, he graduated third in the class of 1951 with a Bachelor of Science degree. Through the Air Force Institute of Technology, Aldrin enrolled as a graduate student at the Massachusetts Institute of Technology (MIT) in 1959, intending to earn a master's degree. His astrodynamics class was taught by Richard Battin. Two other USAF officers who later became astronauts, David Scott and Edgar Mitchell took this course around this time, while another, Charles Duke wrote his 1964 master's degree at MIT under the supervision of Laurence R. Young. Aldrin enjoyed the classwork and soon decided to pursue a doctorate instead. In January 1963, he earned a Sc.D. degree in astronautics. His doctoral thesis was Line-of-Sight Guidance Techniques for Manned Orbital Rendezvous, the dedication of which read: "In the hopes that this work may in some way contribute to their exploration of space, this is dedicated to the crew members of this country's present and future manned space programs. If only I could join them in their exciting endeavors!" Aldrin chose his doctoral thesis in the hope that it would help him be selected as an astronaut, although it meant foregoing test pilot training, which was a prerequisite at the time. Aldrin's initial application to join the astronaut corps when NASA's Astronaut Group 2 was selected in 1962 was rejected on the ground that he was not a test pilot. He was aware of the requirement, and asked for it to be waived, but this request was turned down. On May 15, 1963, NASA announced another round of selections. This time requirement was that applicants had either test pilot experience or 1,000 hours flying time in jet aircraft, and Aldrin had over 2,500 hours of flying time, of which 2,200 was in jets. His selection as one of fourteen members of NASA's Astronaut Group 3, was publicly announced on October 18, 1963. This made him the first astronaut with a doctoral degree. Combined with his expertise in orbital mechanics, it earned him his nickname from his fellow astronauts. "From the outset," Walter Cunningham, a fellow member of the 1963 group, recalled, "Buzz was referred to as 'Dr. Rendezvous' because of his obsession with rendezvous in space." Aldrin was aware that it was not always intended as a compliment. Jim Lovell and Aldrin were selected as the backup commander and pilot respectively of Gemini 10. Backup crews usually became the prime crew of the third following mission, but in this case that would be Gemini 13 which did not exist; the last scheduled mission in the program was Gemini 12. But the February 28, 1966, deaths of the Gemini 9 prime crew, Elliot See and Charles Bassett, in an air crash, led to Lovell and Aldrin being moved up one mission on March 21 to backup for Gemini 9, which put them in position as prime crew for Gemini 12. They were officially designated its prime crew on June 17, 1966, with Gordon Cooper and Gene Cernan as their backups. Initially, Gemini 12's mission objectives were uncertain. As the last scheduled mission, it was primarily intended to complete tasks that had not been successfully or fully carried out on earlier missions. While NASA had successfully performed rendezvous during Project Gemini, the gravity-gradient stabilization test on Gemini 11 was unsuccessful. NASA also had concerns about extra-vehicular activity (EVA). 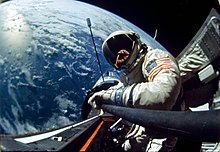 Cernan on Gemini 9 and Richard Gordon on Gemini 11 had suffered from fatigue carrying out tasks during EVA. Whereas Michael Collins had a successful EVA on Gemini 10, which suggested that the order in which he had performed his tasks was an important factor. Lovell and Aldrin were assigned to an Apollo crew with Neil Armstrong as Commander, Lovell as Command Module Pilot (CMP) and Aldrin as Lunar Module Pilot (LMP). Their assignment as the backup crew of Apollo 9 was officially announced on November 20, 1967. Due to design and manufacturing delays in the lunar module (LM), Apollo 8 and Apollo 9 swapped prime and backup crews, and Armstrong's crew became the backup for Apollo 8. Under the normal crew rotation scheme, Armstrong was then expected to command Apollo 11. Michael Collins, the CMP on the Apollo 8 prime crew, experienced trouble with his legs that required surgery to remove a bone spur on his spine. Lovell took his place on the Apollo 8 crew. When Collins recovered he joined Armstrong's crew as CMP. In the meantime, Fred Haise filled in as backup LMP, and Aldrin as backup CMP for Apollo 8. An effect of this was that while the CMP usually occupied the center couch on takeoff, Aldrin occupied it rather than Collins, as he had already been trained to operate its console on liftoff before Collins arrived. Early versions of the EVA checklist had the Lunar Module Pilot as the first to step onto the lunar surface. However, when Aldrin learned that this might be amended, he lobbied within NASA for the original procedure to be followed. Multiple factors contributed to the final decision, including the physical positioning of the astronauts within the compact lunar lander, which made it easier for Armstrong to be the first to exit the spacecraft. Furthermore, there was little support for Aldrin's views among senior astronauts who would command later Apollo missions. Collins has commented that he thought Aldrin "resents not being first on the Moon more than he appreciates being second." Aldrin and Armstrong did not have time to perform much geological training. The first lunar landing focused more on landing on the Moon and making it safely back to Earth than the scientific aspects of the mission. 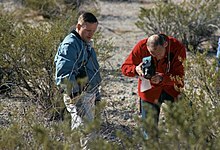 The duo were briefed by NASA and USGS geologists. They made one geological field trip to west Texas. The press followed them, and a helicopter made it hard for Aldrin and Armstrong to hear their instructor. An estimated one million spectators watched the launch of Apollo 11 from the highways and beaches in the vicinity of the launch site. The launch was televised live in 33 countries, with an estimated 25 million viewers in the United States alone. Millions more listened to radio broadcasts. Propelled by a giant Saturn V rocket, Apollo 11 lifted off from Launch Complex 39 at the Kennedy Space Center on July 16, 1969, at 13:32:00 UTC (9:32:00 EDT), and entered Earth orbit twelve minutes later. After one and a half orbits, the S-IVB third-stage engine pushed the spacecraft onto its trajectory toward the Moon. About 30 minutes later, the transposition, docking, and extraction maneuver was performed: this involved separating the command module Columbia from the spent S-IVB stage, turning around, and docking with lunar module Eagle. After the lunar module was extracted, the combined spacecraft headed for the Moon, while the rocket stage flew on a trajectory past the Moon. On July 19 at 17:21:50 UTC, Apollo 11 passed behind the Moon and fired its service propulsion engine to enter lunar orbit. In the thirty orbits that followed, the crew saw passing views of their landing site in the southern Sea of Tranquillity about 12 miles (19 km) southwest of the crater Sabine D. At 12:52:00 UTC on July 20, Aldrin and Armstrong entered Eagle, and began the final preparations for lunar descent. At 17:44:00 Eagle separated from the Columbia. Collins, alone aboard Columbia, inspected Eagle as it pirouetted before him to ensure the craft was not damaged and that the landing gear was correctly deployed. Aldrin, a Presbyterian elder, was the first and only person to hold a religious ceremony on the Moon. He radioed Earth: "I'd like to take this opportunity to ask every person listening in, whoever and wherever they may be, to pause for a moment and contemplate the events of the past few hours, and to give thanks in his or her own way." Using a kit given to him by his pastor, he took communion, but he kept it secret because of a lawsuit over the reading of Genesis on Apollo 8. In 1970 he noted: "It was interesting to think that the very first liquid ever poured on the Moon, and the first food eaten there, were communion elements." On reflection in his 2009 book, Aldrin felt that "Perhaps, if I had it to do over again, I would not choose to celebrate communion. Although it was a deeply meaningful experience for me, it was a Christian sacrament, and we had come to the Moon in the name of all mankind – be they Christians, Jews, Muslims, animists, agnostics, or atheists. But at the time I could think of no better way to acknowledge the enormity of the Apollo 11 experience than by giving thanks to God." Aldrin reentered Eagle first. With some difficulty they lifted film and two sample boxes containing 21.55 kilograms (47.5 lb) of lunar surface material to the hatch using a flat cable pulley device. Armstrong reminded Aldrin of a bag of memorial items in his sleeve pocket, and Aldrin tossed the bag down. It contained a mission patch for the Apollo 1 flight that Ed White never flew due to his death in the fire; medallions commemorating Yuri Gagarin, the first man in space, and Vladimir Komarov, the first man to die in a space flight, and a silicon disk etched with goodwill messages from 73 nations. After transferring to LM life support, the explorers lightened the ascent stage for the return to lunar orbit by tossing out their backpacks, lunar overshoes, an empty Hasselblad camera, and other equipment. The hatch was closed again at 05:01, and they repressurized the lunar module and settled down to sleep. This mission allowed Aldrin to maintain his record EVA duration until it was surpassed in the Apollo 14 mission. The chance of bringing back pathogens from the lunar surface was considered a remote possibility, so divers passed biological isolation garments (BIGs) to the astronauts, and assisted them into the life raft. The astronauts were winched on board the recovery helicopter, and flown to the aircraft carrier USS Hornet, where they spent the first part of the Earth-based portion of 21 days of quarantine. On August 13, the three astronauts rode in ticker-tape parades in their honor in New York and Chicago, attended by an estimated six million people. An official state dinner that evening in Los Angeles celebrated the flight. President Richard Nixon honored each of them with a presentation of the highest award a civilian can receive, the Presidential Medal of Freedom. 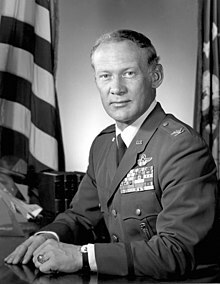 Aldrin hoped to become Commandant of Cadets at the United States Air Force Academy, however this job was given to his West Point classmate Hoyt S. Vandenberg Jr. Aldrin was assigned as Commandant of the USAF Aerospace Research Pilot School at Edwards Air Force Base, California. Aldrin had neither managerial nor test pilot experience, but a third of the training curriculum was devoted to astronaut training and students flew a modified F-104 Starfighter to the edge of space. Fellow Group 3 astronaut and moonwalker Alan Bean considered him well-qualified for the job. Aldrin's father died on December 28, 1974, from complications following a heart attack. His autobiographies Return to Earth, (1973) and Magnificent Desolation (2009), recounted Aldrin's struggles with clinical depression and alcoholism in the years after leaving NASA. He was reduced to selling used cars, at which he had no talent. Periods of hospitalization and sobriety alternated with bouts of heavy drinking. Eventually he was arrested for disorderly conduct. Finally, in October 1978, he quit drinking for good. He attempted to help William Holden, whose girlfriend Stefanie Powers had played Marianne, a women with whom Aldrin had an affair, in the TV movie version of Return to Earth, with his drinking problem. Aldrin was saddened by Holden's alcohol-related death in 1981. In 1999, while celebrating the 30th anniversary of the lunar landing, Vice President Al Gore, who was also the vice chancellor of the Smithsonian Institution's Board of Regents, presented the Apollo 11 crew with the Smithsonian Institution's Langley Gold Medal for aviation. After the ceremony, the crew went to the White House and presented President Bill Clinton with an encased Moon rock. The Apollo 11 crew was awarded the New Frontier Congressional Gold Medal in the Capitol Rotunda in 2011. During the ceremony, NASA administrator Charles Bolden said, "Those of us who have had the privilege to fly in space followed the trail they forged." The Apollo 11 crew were awarded the Collier Trophy in 1969. The National Aeronautic Association president awarded a duplicate trophy to Collins and Aldrin at a ceremony. The crew was awarded the 1969 General Thomas D. White USAF Space Trophy. The National Space Club named the crew the winners of the 1970 Dr. Robert H. Goddard Memorial Trophy, awarded annually for the greatest achievement in spaceflight. They received the international Harmon Trophy for aviators in 1970, conferred to them by Vice President Spiro Agnew in 1971. Agnew also presented them the Hubbard Medal of the National Geographic Society in 1970. He told them, "You've won a place alongside Christopher Columbus in American history". In 1970, the Apollo 11 team were co-winners of the Iven C. Kincheloe award from the Society of Experimental Test Pilots along with Darryl Greenamyer who broke the world speed record for piston engine airplanes. For contributions to the television industry, they were honored with round plaques on the Hollywood Walk of Fame. Aldrin has been married three times. His first marriage was on December 29, 1954, to Joan Archer, a Rutgers University and Columbia University alumna with a master's degree. They had three children, James, Janice and Andrew. They filed for divorce in 1974. His second was to Beverly Van Zile, whom he married on December 31, 1975, and divorced in 1978. His third was to Lois Driggs Cannon, whom he married on February 14, 1988. Their divorce was finalized in December 2012. The settlement included 50 percent of their $475,000 bank account, and $9,500 a month plus 30 percent of his annual income, estimated at more than $600,000. As of 2017, he has one grandson, Jeffrey Schuss, born to his daughter Janice, and three great-grandsons. 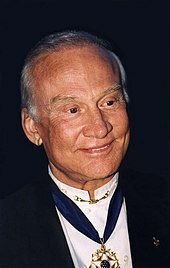 In 2018 Aldrin was involved in a legal dispute with his children Andrew and Janice and former business manager Christina Korp over their claims that he was mentally impaired through dementia and Alzheimer's disease. The name of the Toy Story character Buzz Lightyear was inspired by Buzz Aldrin. Aldrin acknowledged the tribute when he pulled a Buzz Lightyear doll out during a speech at NASA, a clip of which can be found on the Toy Story 10th Anniversary DVD. Aldrin, Edwin E. Jr. 1970. Footsteps on the Moon. Edison Electric Institute Bulletin. Vol. 38, No. 7, pp. 266–272. Armstrong, Neil; Michael Collins; Edwin E. Aldrin; Gene Farmer; and Dora Jane Hamblin. 1970. First on the Moon: A Voyage with Neil Armstrong, Michael Collins, Edwin E. Aldrin Jr. Boston: Little, Brown. Aldrin, Buzz and Wayne Warga. 1973. Return to Earth. New York: Random House. Aldrin, Buzz and John Barnes. 1996. Encounter with Tiber. London: Hodder & Stoughton. Aldrin, Buzz. 2013. Mission to Mars. Washington, D.C.: The National Geographic Society. Aldrin, Buzz and Marianne Dyson. 2015. Welcome to Mars: Making a Home on the Red Planet. Washington, D.C.: National Geographic Children's Books. Aldrin, Buzz and Ken Abraham. 2016. No Dream Is Too High: Life Lessons From a Man Who Walked on the Moon. Washington, D.C.: National Geographic. ↑ "To the Moon and beyond". The Record (Bergen County). July 20, 2009. Archived from the original on May 16, 2011. Retrieved July 20, 2009. ↑ Hansen 2005, pp. 348–349. ↑ Grier 2016, pp. 87–88. 1 2 Hansen 2005, p. 349. ↑ Engineer, Cyrus (June 26, 2018). "How old is Buzz Aldrin, what's his net worth, what has he said about aliens and UFOs and when did he walk on the moon?". The Sun. Retrieved November 4, 2018. ↑ Chaikin 2007, p. 585. ↑ "Scouting and Space Exploration". Boy Scouts of America. Archived from the original on March 4, 2016. 1 2 "Buzz Aldrin... Scholar". Courier-Post. Camden, New Jersey. August 1, 1969. p. 46 – via Newspapers.com. ↑ Garda, Andrew (July 1, 2018). "Montclair 150: Dozens of Greats Who Have Played Sports in Montclair". Montclair Local News. Retrieved August 23, 2018. ↑ Snyder, Steve (September 17, 1969). "At 57, Rookie Tries Hand". The Tampa Tribune. Tampa, Florida. UPI. p. 52 – via Newspapers.com. 1 2 Hansen 2005, p. 351. ↑ "Buzz Aldrin to Speak at Severn School". Severn School. Retrieved November 5, 2018. ↑ Redd, Nola Taylor (June 23, 2012). "Buzz Aldrin & Apollo 11". Space.com. Retrieved April 14, 2018. 1 2 3 4 Grier 2016, p. 92. ↑ Grier 2016, p. 89. ↑ Aldrin & Abraham 2009, p. 36. 1 2 3 4 Cullum 1960, p. 588. ↑ Grier 2016, pp. 89–90. 1 2 Grier 2016, p. 90. 1 2 3 Aldrin & Abraham 2009, pp. 90–91. ↑ Grier 2016, pp. 90–91. 1 2 3 Grier 2016, p. 91. ↑ "Communist Pilot is Catapulted from Crippled MIG". Life. Vol. 34 no. 23. June 8, 1953. p. 29. ISSN 0024-3019. Retrieved November 8, 2012. ↑ Aldrin & Abraham 2009, pp. 91–93. ↑ "2000 Distinguished Graduate Award". West Point Association of Graduates. Retrieved November 5, 2018. 1 2 3 4 5 "Astronaut Bio: Buzz Aldrin". NASA. Retrieved August 18, 2018. ↑ Hansen 2005, p. 354. ↑ Hansen 2005, p. 353. 1 2 3 Chaikin 2007, p. 139. ↑ Chandler, David L. (June 3, 2009). "To the Moon, by way of MIT" (PDF). TechTalk. Vol. 53 no. 27. pp. 6–8. Retrieved February 1, 2019. 1 2 Aldrin, Buzz (1963). Line-of-sight guidance techniques for manned orbital rendezvous (Sc.D.). MIT. Archived from the original on May 11, 2015. 1 2 Burgess 2013, p. 285. ↑ Burgess 2013, p. 203. ↑ Burgess 2013, p. 199. ↑ "14 New Astronauts Introduced at Press Conference" (PDF). NASA. October 30, 1963. Archived from the original (PDF) on April 17, 2017. Retrieved April 13, 2018. ↑ Chaikin 2007, p. 143. ↑ Bostick, Jerry C. (February 23, 2000). "Jerry C. Bostick Oral History" (Interview). Interviewed by Carol Butler. NASA Johnson Space Center Oral History Project. Retrieved December 10, 2016. ↑ Roger Ressmeyer (July 15, 1999). "Buzz Aldrin plans the next giant leap". NBC News. Retrieved December 10, 2016. ↑ Cunningham 2010, p. 56. ↑ Burgess 2013, p. 322. ↑ Collins 2001, p. 100. ↑ Hansen 2005, p. 357. ↑ Hacker & Grimwood 1974, pp. 323–325. ↑ Chaikin 2007, p. 51. ↑ Hacker & Grimwood 1974, p. 354. ↑ Hacker & Grimwood 1974, pp. 370–371. 1 2 Reichl 2013, pp. 137–138. 1 2 3 Hacker & Grimwood 1974, pp. 372–373. 1 2 3 4 5 "Gemini 12". NASA Space Science Data Coordinated Archive. Archived from the original on August 15, 2017. Retrieved August 9, 2017. 1 2 Chaikin 2007, p. 140. 1 2 Hacker & Grimwood 1974, pp. 375–376. ↑ Reichl 2013, pp. 141–142. ↑ Reichl 2013, p. 142. ↑ Brooks, Grimwood & Swenson 1979, p. 374. ↑ Collins 2001, p. 359. 1 2 Orloff 2000, p. 90. ↑ Orloff 2000, p. 72. ↑ Hansen 2005, pp. 338–339. ↑ Chaikin 2007, p. 148. ↑ Collins 2001, p. 60. ↑ Chaikin 2007, p. 179. ↑ Bilstein 1980, pp. 369–370. ↑ Benson & Faherty 1978, p. 474. ↑ Loff, Sarah (December 21, 2017). "Apollo 11 Mission Overview". NASA. Retrieved January 13, 2019. 1 2 3 4 5 6 7 8 Orloff 2000, pp. 102–110. ↑ "Apollo-11 (27)". Historical Archive for Manned Missions. NASA. Retrieved June 13, 2013. ↑ "Apollo 11 Lunar Landing Mission" (PDF) (Press kit). Washington, D.C.: NASA. July 6, 1969. Release No: 69-83K. Retrieved June 13, 2013. ↑ Collins & Aldrin 1975, p. 209. ↑ Mindell 2008, p. 226. ↑ Collins & Aldrin 1975, pp. 210–212. ↑ Jones, Eric M., ed. (1995). "The First Lunar Landing". Apollo 11 Lunar Surface Journal. NASA. Retrieved June 13, 2013. ↑ "James May speaks to Charles Duke". BBC Archives. 2009. Retrieved June 7, 2009. ↑ Chaikin 2007, p. 205. ↑ Farmer & Hamblin 1970, p. 251. ↑ Chaikin 2007, p. 204. ↑ Aldrin, Buzz (July 10, 2014) . "Buzz Aldrin on Communion in Space". Guideposts. Guideposts Classics. ↑ Aldrin & Abraham 2009, p. 27. ↑ Schwagmeier, Thomas (ed.). "Apollo 11 Transcription". Apollo Lunar Surface Journal. NASA. Retrieved January 13, 2019. ↑ Chaikin 2007, pp. 212–213. 1 2 Chaikin 2007, p. 215. ↑ Chaikin 2007, pp. 214–215. ↑ Chaikin 2007, pp. 216–217. ↑ Rosen, Rebecca J. (August 27, 2012). "The Missing Man: There Are No Good Pictures of Neil Armstrong on the Moon". The Atlantic. Retrieved November 10, 2018. ↑ Jones, Eric M.; Glover, Ken, eds. (1995). "First Steps". Apollo 11 Lunar Surface Journal. NASA. Retrieved September 23, 2006. ↑ Aldrin & Abraham 2009, p. 41. ↑ Jones, Eric M., ed. (1995). "Trying to Rest". Apollo 11 Lunar Surface Journal. NASA. Retrieved June 13, 2013. ↑ Williams, David R. "Apollo Tables". NASA. Archived from the original on October 1, 2006. Retrieved September 23, 2006. ↑ Woods, W. David; MacTaggart, Kenneth D.; O'Brien, Frank (eds.). "Day 9: Re-entry and Splashdown". Apollo 11 Flight Journal. NASA. Retrieved September 27, 2018. ↑ Graham, Jane (November 20, 2018). "Letter to my younger self – Buzz Aldrin". Big Issue. Retrieved April 8, 2016. ↑ Manned Spacecraft Center 1969, pp. 164–167. ↑ Carmichael 2010, pp. 199–200. ↑ "President Offers Toast to 'Three Brave Men'". The Evening Sun. Baltimore, Maryland. Associated Press. August 14, 1969. p. 1 – via Newspapers.com. ↑ "Richard Nixon: Remarks at a Dinner in Los Angeles Honoring the Apollo 11 Astronauts". The American Presidency Project. August 13, 1969. Retrieved November 20, 2018. ↑ Smith, Merriman (August 14, 1969). "Astronauts Awed by the Acclaim". The Honolulu Advertiser. Honolulu, Hawaii. UPI. p. 1 – via Newspapers.com. ↑ "The Apollo 11 Crew Members Appear Before a Joint Meeting of Congress". United States House of Representatives. Retrieved March 3, 2018. ↑ Bloom, Mark (September 17, 1969). "Astro Bids Congress Put a Yank on Mars". Daily News. New York, New York. p. 6 – via Newspapers.com. ↑ "Japan's Sato Gives Medals to Apollo Crew". Los Angeles Times. Los Angeles, California. November 5, 1969. p. 20 – via Newspapers.com. ↑ "Australia Welcomes Apollo 11 Heroes". The Sydney Morning Herald. Sydney, New South Wales. November 1, 1969. p. 1 – via Newspapers.com. ↑ Aldrin & Abraham 2009, pp. 81–87. ↑ Aldrin & Abraham 2009, pp. 88–89. ↑ Aldrin & Abraham 2009, pp. 120–121. ↑ Aldrin & Abraham 2009, pp. 113–114. 1 2 3 Aldrin & Abraham 2009, pp. 116–120. 1 2 Aldrin & Abraham 2009, pp. 100–103. ↑ Aldrin & Abraham 2009, pp. 105–109. ↑ Solomon, Deborah (June 15, 2009). "The Man on the Moon". The New York Times Magazine. p. MM13. Retrieved December 18, 2017. ↑ Aldrin & Abraham 2009, pp. 147–148. ↑ Seida, Jim (August 12, 2014). "Robin Williams' Death Reminds Buzz Aldrin of His Own Struggle". NBC News. Retrieved October 21, 2018. 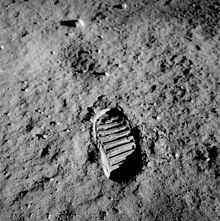 ↑ "After walking on moon, astronauts trod various paths". CNN. July 17, 2009. Retrieved April 27, 2010. ↑ Read, Kimberly (January 4, 2005). "Buzz Aldrin". Bipolar. About. Archived from the original on September 28, 2008. Retrieved November 2, 2008. ↑ Aldrin & Abraham 2009, pp. 165–166. ↑ Aldrin & Abraham 2009, pp. 170–173. ↑ Bancroft, Colette (September 29, 2002). "Lunar Lunacy". Tampa Bay Times. St. Petersburg, Florida. p. 1F – via Newspapers.com. ↑ "Ex-astronaut escapes assault charge". BBC News. September 21, 2002. Retrieved January 9, 2018. ↑ "Buzz Aldrin Punches a Jerk in the Face for Calling Him a Liar". The Week. July 21, 2014. Retrieved July 21, 2014. ↑ Price, Wayne T. (April 2, 2017). 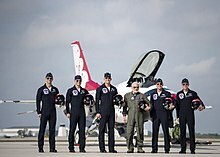 "Buzz Aldrin flies with the Thunderbirds". Florida Today. Retrieved November 10, 2018. ↑ Horton, Alex (April 10, 2018). "No, Buzz Aldrin didn't see a UFO on his way to the moon". The Washington Post. Retrieved November 5, 2018. ↑ Morrison, David (July 26, 2006). "NASA Ask an Astrobiologist". NASA. Archived from the original on July 21, 2011. ↑ Morrison, David (2009). "UFOs and Aliens in Space". Skeptical Inquirer. 33 (1): 30–31. Retrieved October 25, 2015. ↑ McCann, Erin (December 1, 2016). "Buzz Aldrin Is Evacuated From the South Pole After Falling Ill". The New York Times. Retrieved December 1, 2016. ↑ Wang, Amy B (December 6, 2016). "Buzz Aldrin being treated by a doctor named David Bowie (yes) after South Pole evacuation". The Washington Post. Retrieved December 6, 2016. ↑ Holley, Peter (December 14, 2016). "Buzz Aldrin nearly died at the South Pole. Why he insists 'it was worth it, really.'". The Washington Post. Retrieved November 5, 2018. ↑ Rice, Daniel R. (1992). The Clifford Years: The University of North Dakota, 1971–1992. p. 46. ↑ "Buzz Aldrin and Snoop Dogg reach for the stars with Rocket Experience". The Times. June 25, 2009. Retrieved November 10, 2018. ↑ Aldrin, E.E., "Cyclic Trajectory Concepts," SAIC presentation to the Interplanetary Rapid Transit Study Meeting, Jet Propulsion Laboratory, October 1985. ↑ Byrnes, D.V. ; Longuski, J.M. ; and Aldrin, B. (1993). "Cycler Orbit Between Earth and Mars" (PDF). Journal of Spacecraft and Rockets. 30 (3): 334–336. Bibcode:1993JSpRo..30..334B. doi:10.2514/3.25519. Retrieved October 25, 2015. ↑ "Aldrin Mars Cycler". buzzaldrin.com. Retrieved August 18, 2018. ↑ Aldrin, Buzz (December 5, 2003). "Fly Me To L1". The New York Times. Retrieved November 14, 2009. ↑ Aldrin, Buzz (June 13, 2013). "The Call of Mars". The New York Times. Retrieved June 17, 2013. ↑ Dunn, Marcia (August 27, 2015). "Buzz Aldrin joins university, forming 'master plan' for Mars". Associated Press. Retrieved August 30, 2015. 1 2 3 "Valor Awards for Buzz Aldrin". Hall of Valor. Retrieved December 25, 2017. ↑ "Johnson Sees Greater U.S. Success in Space". The Evening Times. Sayre, Pennsylvania. Associated Press. November 23, 1966. p. 1 – via Newspapers.com. ↑ Gawdiak & Fedor 1994, p. 398. 1 2 "Second man to set foot on the Moon". New Mexico Museum of Space History. Retrieved August 18, 2018. ↑ Shay, Erin (October 3, 1982). "Astronauts Laud Gemini as Precursor to Shuttle". Albuquerque Journal. Albuquerque, New Mexico. p. 3 – via Newspapers.com. ↑ "Buzz Aldrin". Astronaut Scholarship Foundation. Retrieved August 20, 2018. ↑ "Aldrin, Buzz: Enshrined 2000". The National Aviation Hall of Fame. Retrieved December 19, 2017. ↑ Hester, Tom (October 25, 2007). "Frank, Bruce and Buzz among first inducted into NJ hall of fame". nj.com. Archived from the original on November 9, 2013. Retrieved August 19, 2018. ↑ Boyle, Alan. "Moon Anniversary Celebrated". NBC News. Retrieved March 3, 2018. ↑ "Apollo 11 astronauts honored for 'astonishing' mission". CNN. July 20, 1999. Retrieved April 24, 2018. ↑ "NASA Legends Awarded Congressional Gold Medal". NASA. November 16, 2011. Retrieved December 19, 2017. ↑ Congressional Gold Medal to Astronauts Neil A. Armstrong, Buzz Aldrin, and Michael Collins. 2000 Congressional Record, Vol. 146, Page H4714 (June 20, 2000). Accessed April 16, 2015. ↑ "Apollo 11 Spacemen Win Collier Trophy". The Charleston Daily Mail. Charleston, West Virginia. Associated Press. March 18, 1970. p. 9 – via Newspapers.com. ↑ "The Gen. Thomas D. White USAF Space Trophy" (PDF). USAF. May 1997. p. 156. ↑ "Astronauts of Apollo 11 to be Feted". The Times. Shreveport, Louisiana. Associated Press. March 6, 1970. p. 10 – via Newspapers.com. ↑ "Two R.A.F. Pilots to Share Harmon Aviator's Trophy". The New York Times. September 7, 1970. p. 36. Retrieved March 3, 2018. ↑ "Apollo 11 Astronauts Add Harmon Trophy to Collection". The Montgomery Advertiser. Montgomery, Alabama. Associated Press. September 6, 1970. p. 6E – via Newspapers.com. ↑ "3 Astronauts get Harmon Trophies". The Times. Shreveport, Louisiana. Associated Press. May 20, 1971. p. 2-B – via Newspapers.com. ↑ "Agnew Gives Medals to Apollo 11 Crew". The La Crosse Tribune. La Crosse, Wisconsin. Associated Press. February 18, 1970. p. 6 – via Newspapers.com. ↑ "Record Setting Aviators Honored by Pilots Group". Valley News. Van Nuys, California. October 10, 1970. p. 51 – via Newspapers.com. ↑ Sandell, Scott (March 1, 2010). "Apollo Landing - Hollywood Star Walk". Los Angeles Times. Retrieved November 20, 2018. ↑ "Personnel Announcements". The White House. August 22, 2001. Archived from the original on September 2, 2017. ↑ "Variety International Humanitarian Awards". Variety, the Children's Charity. Archived from the original on September 27, 2007. Retrieved May 7, 2007. ↑ Farquhar, Peter (July 2, 2018). "Australia finally has a space agency -- here's why it's about time". Business Insider Australia. Retrieved January 19, 2019. ↑ "National Space Society Board of Governors". National Space Society. Retrieved December 19, 2017. ↑ Kent, Spencer (September 16, 2016). "N.J. middle school renamed after Apollo 11's Buzz Aldrin". NJ Advance Media. Retrieved March 14, 2017. ↑ Aldrin & Abraham 2009, p. 75. ↑ Woo, Elaine (July 31, 2015). "Joan Archer Aldrin dies at 84; dealt with the spotlight as astronaut's wife". Los Angeles Times. Retrieved December 1, 2018. ↑ Aldrin & Abraham 2009, p. 154. ↑ Aldrin & Abraham 2009, p. 224. ↑ "Buzz Aldrin officially divorced". TMZ. July 1, 2013. Retrieved November 20, 2018. ↑ "Buzz Aldrin Fast Facts". CNN. Retrieved November 20, 2018. ↑ Buzz Aldrin [@TheRealBuzz] (April 17, 2017). "Aldrin Tweet about Great Grandchildren" (Tweet). Retrieved December 18, 2017 – via Twitter. ↑ "US astronaut Buzz Aldrin sues his two children for 'misuse of finances' – BBC News". BBC Online. June 26, 2018. Retrieved June 26, 2018. ↑ Foust, Jeff (August 19, 2014). "Buzz Aldrin endorses candidate in Alaska Senate race". Space Politics. Retrieved November 11, 2018. ↑ Wallace, Jeremy (January 12, 2018). "Buzz Aldrin endorses GOP contender in contest to succeed Ted Poe". Houston Chronicle. Retrieved November 11, 2018. ↑ "Buzz Aldrin makes guest appearance at Donald Trump's State of the Union address - The National". The National. February 6, 2019. Retrieved February 13, 2019. ↑ Aldrin, Buzz (August 25, 2012). "On the Passing of Neil Armstrong" (Official statement). Retrieved October 25, 2015. ↑ "10 Questions for Buzz Aldrin". Time. September 6, 2007. Retrieved March 2, 2014. ↑ Aldrin & Abraham 2009. ↑ Beale, Lauren (June 25, 2014). "Astronaut Buzz Aldrin sells Wilshire Corridor condo". Los Angeles Times. Archived from the original on December 20, 2016. ↑ Staff Reports, Wire and (December 2, 2016). "'Ailing' Buzz Aldrin recuperating". Florida Today. Melbourne, Florida. pp. 1A. Archived from the original on February 19, 2017. Retrieved December 2, 2016. ↑ Dean, James (June 22, 2018). "Buzz Aldrin sues his family alleging fraud". Florida Today. Retrieved November 14, 2018. ↑ Elman 2014, p. 39. ↑ "After Dark Series 3". Open Media. Retrieved October 21, 2018. ↑ Pearlman, Robert Z. (September 10, 2014). "Woo Hoo! Buzz Aldrin's Role on 'The Simpsons' Leads to Action Figure". collectSPACE. Retrieved August 6, 2018 – via Space.com. ↑ Blevins, Tal (July 13, 2005). "Space Ghost Coast to Coast Volume 3". IGN. Retrieved December 18, 2017. ↑ "Space Ghost Coast to Coast". TV Guide. Retrieved August 19, 2018. ↑ Pearlman, Robert (August 25, 2017). "Disney's Miles From Tomorrowland: Buzz Aldrin". collectSPACE. Retrieved August 8, 2018. ↑ Butler, Bethonie (July 13, 2018). "Here's how Sacha Baron Cohen fools celebrities into embarrassing interviews, starting with 'Da Ali G Show'". The Washington Post. Retrieved October 21, 2018. ↑ O'Hare, Kate (December 13, 2006). "Aldrin drops in on 'Numb3rs' episode". Zap2it.com. Retrieved August 6, 2018 – via Chicago Tribune. ↑ Bradshaw, Peter (November 2, 2007). "In the Shadow of the Moon". The Guardian. Retrieved October 21, 2018. ↑ O'Neill, Ian (August 15, 2008). "Film Review: "Fly Me to the Moon"". Universe Today. Retrieved October 21, 2018. ↑ Carlson, Daniel (May 7, 2010). "NBC's Thursday Night: I Walked On Your Face!". Houston Press. Retrieved August 19, 2018. ↑ Escherich, Katie (April 7, 2010). "Buzz Aldrin Done on 'Dancing With the Stars' but Proud to Have Inspired People". ABC News. Retrieved October 21, 2018. ↑ Hart, Hugh (June 29, 2011). "History Adds Heft to Transformers: Dark of the Moon's Action Overkill". Wired. Retrieved August 12, 2018. ↑ Ferrante, A.C. (June 21, 2011). "Exclusive Interview: David X. Cohen of FUTURAMA gives the scoop on Season 6B". Assignment X. Retrieved January 7, 2012. ↑ "小栗旬＆岡田将生主演『宇宙兄弟』に野口聡一、バズ・オルドリンが出演" [Shunichi Noguchi and Buzz Aldrin appear in 'Space Brothers', starring Oguri Shun & Masao Okada]. ぴあ映画生活 (Pia Movie Life) (in Japanese). March 22, 2012. Retrieved December 1, 2016. ↑ Derschowitz, Jessica (October 10, 2012). "Buzz Aldrin lands cameo on "The Big Bang Theory"". CBS News. Retrieved August 8, 2018. ↑ Griffiths, Daniel Nye (June 28, 2012). "The Real Hero Of Mass Effect Explains How – And Why – The 'Reject Ending' Works". Forbes. Retrieved August 6, 2018. ↑ Egan 2016, p. 168. ↑ "Från Senegal till Buzz Aldrin" [From Senegal to Buzz Aldrin] (in Northern Sami). Discovery. October 7, 2015. Retrieved August 21, 2018. ↑ Lederman, Jason (May 5, 2016). "Buzz Aldrin Reveals His Secret "Scoops" About The Moon Missions". Popular Science. Retrieved August 6, 2018. ↑ "A Very Special Guest: Buzz Aldrin, Season 15 Ep. 3, Hell's Kitchen". Hell's Kitchen. January 27, 2016. Retrieved August 6, 2018 – via YouTube. ↑ Howell, Elizabeth (August 25, 2017). "Moonwalker Buzz Aldrin Plays 'Commander Copernicus' in Disney Kids' Show: Exclusive Clip". Space.com. Retrieved August 6, 2018. ↑ O'Connor, John J. (May 14, 1976). "TV Weekend: Friday". The New York Times. p. 76. Retrieved August 19, 2018. ↑ Hanauer, Joan (May 8, 1976). "Cliff Robertson Plays 'Buzz Aldrin'". The Daily Herald. p. 36 – via Newspapers.com. ↑ McGee 2010, p. 23. ↑ King, Susan (November 17, 1996). "Moon Over 'Apollo 11'". Los Angeles Times. p. 433 – via Newspapers.com. ↑ Leopold, Todd (September 19, 2013). "Emmys 2013: Bryan Cranston, man of the moment". CNN. Retrieved April 28, 2018. ↑ James, Caryn (April 3, 1998). "Television Review; Boyish Eyes on the Moon". The New York Times. p. E1. Retrieved August 5, 2018. ↑ Marill (2010), p. 66. ↑ Winters, Carol (July 10, 2011). "Tucker embraces his 'role' in life". Pontiac Daily Leader. Retrieved August 18, 2018. ↑ "Ryan Gosling's Neil Armstrong movie to open Venice Film Festival". BBC. July 19, 2018. Retrieved August 2, 2018. ↑ "Toy Story 3 Featurette – Buzz Lightyear". Trailer Addict. June 18, 2010. Retrieved August 29, 2010. ↑ "No More "Spam in a Can"" (PDF). Computer Gaming World (90): 48–50. January 1992. ISSN 0744-6667. OCLC 8482876. Retrieved January 14, 2019. Collins, Michael; Aldrin, Edwin E., Jr. (1975). "The Eagle Has Landed". In Cortright, Edgar M. Apollo Expeditions to the Moon. Washington, DC: NASA. pp. 203–224. OCLC 1623434. NASA SP-350. Retrieved June 13, 2013. Cortright, Edgar M (1975). "Scouting the Moon". In Cortright, Edgar M. Apollo Expeditions to the Moon. Washington, DC: NASA. pp. 79–102. OCLC 1623434. NASA SP-350. Retrieved June 13, 2013.